This is Page 4 of a six-page review Here, our favorite hams, starting with Bilinski’s Champagne Ham. Click on the black links below to visit other pages. 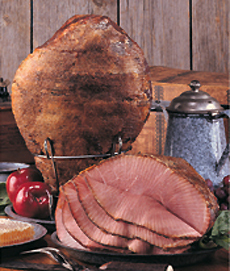 While there are many producers of quality ham in the U.S., many people think of ham as the part-water and part-ham products sold at most supermarkets. Because these commercial hams are sold by weight, they undergo processes designed to pack on the pounds—at the expense of our taste buds. Typically a mix of leg muscles from the pig, commercial hams are passed under needles that inject the processed meat with brine (typically a mix of salt and water), sugars, preservatives, additives like sodium nitrate, and flavorings. They are then submerged in the same solution to absorb even more weight. As a result, the salt often becomes the forefront flavor instead of the ham, and the water is passed off as juices from the meat itself. Salt curing and smoking has, of course, improved over time and with practice. Family recipes have been passed down from generation to generation as invaluable secrets that have made ham an important part of our daily meals, especially during the holidays. Though we endured some bad ham days during our tastings at THE NIBBLE—even with hams that have been heralded as ham-tasting winners from other media—we were impressed by a few truly savory hams worthy of any occasion. Read on to learn about the “winners,” presented in alphabetical order. We make a double toast to the elegantly rich flavors of a Bilinski’s Champagne Ham. Bilinski’s has been making sausages and smoking hams since 1929, and they haven’t lost an ounce of their impressive craftsmanship over the years. Slowly smoked with natural hickory wood chips, this savory meat is steeped in Glenora Brut Champenoise, a sparkling wine from the Finger Lakes region of New York, for three days. It is then lathered in a tantalizing glaze of pineapple juice and brown sugar, so appetizing that we wanted to dress the rest of our food with the same tangy essence. Even a modest bite of this lush meat allows the aroma and flavor of pungent chardonnay grapes to shine through. In fact, the salt flavor that often dominates ham cannot be found at all—only fruity, sweet wine undertones. Made exclusively for the holiday season, Bilinski’s hams will be sold for Easter and are available until they are sold out. The Champagne Ham weighs between 7 and 10 pounds and comes boneless and fully-trimmed. If you are looking for a velvety ham that tastes as exquisite as wine, this one is a true champion. For more information, visit Bilinski.com.